Baryons are the three-quark particles that comprise normal everyday matter. Observations of the early universe indicate that baryons make up 5% of the total mass and energy of the universe. A detailed census of baryonic matter in the local environment does not match with this observation. Around a third of the baryonic matter is missing and purported to be in the form of hot diffuse gas. HaloSat is a 6U cube satellite dedicated to making observations of the extended hot halo of the Milky Way galaxy in an attempt to understand the baryonic content of galactic halos. Understanding the large hot halo of the Milky Way requires an all-sky survey of the diffuse background. As such, a dedicated observatory is required to make the necessary observations. The HaloSat cube satellite is that observatory. By probing the soft X-ray diffuse background of the Milky Way over the entire sky, we aim to extrapolate the mass and geometry of baryonic content in our hot halo. This will also provide a useful metric for measurements of halo contents in other galaxies. 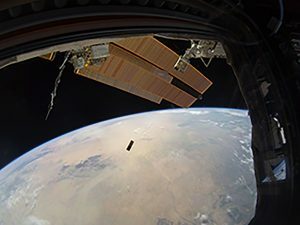 HaloSat was launched aboard the Cygnus spacecraft in May 2018, and ejected from the ISS on July 13, 2018. Currently, HaloSat is in low Earth orbit around Earth and observing the X-ray sky. One of my roles is to plan and schedule observations each day based on a number of criteria and ensure maximum scientific output of the instrument. I am also conducting a diffuse structure analysis of the North Polar Spur, an object visible in the X-ray sky.